The solution for efficient data logging. Do you require a high quality data logger to perform a wide range of measuring tasks? 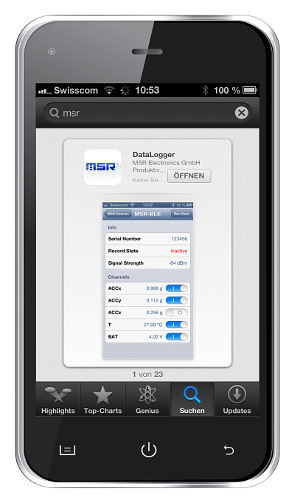 MSR Electronics GmbH develops and markets stand-alone data loggers of the highest quality for a wide range of applications. They are also ideal for long-term measurements. Permanently record temperature, humidity and pressure at various measuring points, in inaccessible locations and at operating temperatures from -20 °C to +125 °C, and monitor them globally via the cloud: The MSR385WD data logger of MSR Electronics, which is equipped with wireless sensors and which is now also available with a GSM terminal, offers these options. MSR175 stand-alone data logger uses high-resolution sensors to continuously record what happens to your goods during transportation. The logger data can then be analysed very accurately  be it in order to ascertain damage or to improve transport packaging  using the MSR ShockViewer software. The two 3-axis acceleration sensors integrated in the MSR175 have working ranges of ±15 g and ±100 g. They record shocks and jolts at a measurement frequency of up to 6,400 measurements per second. The installed memory of the logger is capable of storing over 2 million measured values, which is sufficient for more than 1,000 shocks. In addition, the MSR175 data logger measures and records temperature profiles from -20° to +65 °C. Additionally, a second type variant of this data logger is available with internal humidity, pressure and light sensors.